The Hidden Life of Trees provides an example and the basis of a metaphorical language of the tree as a symbol for sociocracy. Last year we discussed a symbol for sociocracy, Symbol of Sociocracy? — a logo. The symbol that has often emerged in workshops is the tree or tree-like networks. Well, we now have many more reasons to adopt the tree. A review on today’s New York Times of The Hidden Life of Trees: What They Feel, How They Communicate — Discoveries From a Secret World by German forest ranger Peter Wohlleben explains how trees have social networks and take care of each other. Trees in the forest are social beings. “They can count, learn and remember; nurse sick neighbors; warn each other of danger by sending electrical signals across a fungal network known as the “Wood Wide Web.” They keep ancient stumps alive for centuries by feeding them a sugar solution through their roots. Wohlleben applies anthropomorphic terms liberally, describing how trees talk rather than communicate. “Scientific language removes all the emotion.… When I say, ‘Trees suckle their children,’ everyone knows immediately what I mean.” He wants to reawaken a childlike fascination of the forest. Hidden Life has sold 320,000 copies and has been optioned for translation in 19 countries (available in the US in September). The literature on the behavior of trees explains how trees are less like individuals and more like communal beings. They are stronger when working together in networks and sharing resources. Artificially spacing out trees so they get more sunlight and grow faster can disconnect them from their resilience mechanisms. They need more insecticides to maintain themselves.. Ten years ago, Wohlleben left the forestry service discouraged. He had led a successful program in which people could adopt a tree and for a contribution, bury cremated remains beneath it but the forestry service was not supportive or this or similar efforts. As Wohlleben planned to move to Sweden, the city of Hümmel in the Eifel forest also left and hired him to manage their trees. The opportunities for metaphors are obviously numerous and I suspect it will be a fruitful joining of ideas based on the biology of trees. 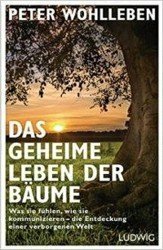 Peter Wohlleben’s website list the many books he has written on biology, nature, and the forest. This is just the latest. I look forward to reading the book in September. Some of you will get to it faster.